Dare with the most demanding format. Our most challenging proposal is the two stages format. It takes three days and two nights, sleeping in Montbrió del Camp and in Margalef del Montsant. An awesome getaway both solo or accompanied. Complete the challenge on the dates you choose and return home with a great memory. Perfect for a weekend. 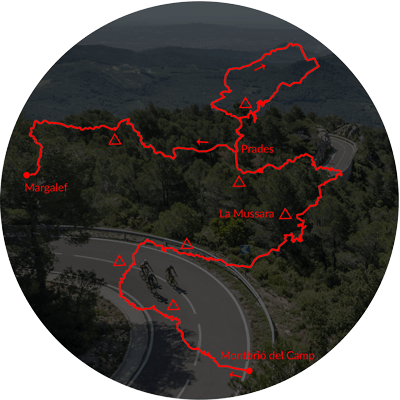 Starting from Montbrió del Camp, at Baix Camp, the first stage accumulates 3300 meters of elevation gain spread over 7 climbs, among which we can highlight La Teixeta, La Mussara and Coll de l’ Arena. 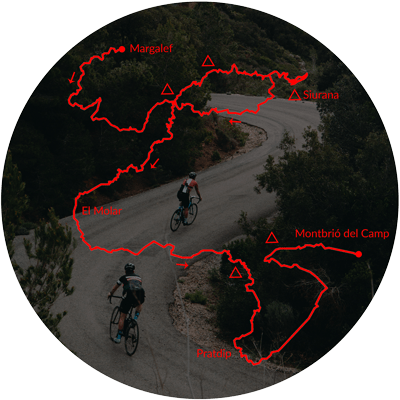 The Serra de La Mussara and Les Muntanyes de Prades take a major role in this first part of the Tour, relieving the place to the Natural Park of Montsant towards the end of the day. The double passage through Prades speaks for itself: one of the most popular villages in the area, where we recommend stopping for a break. The last kilometers take us to surround the incredible Natural Park of the Montsant. The end of your first stage takes place in Margalef, where they will wait for you at the Fonda with a delicious local dinner. We leave Margalef and surround the Montsant passing by Escaladei and surpassing the “No ploris nen”. 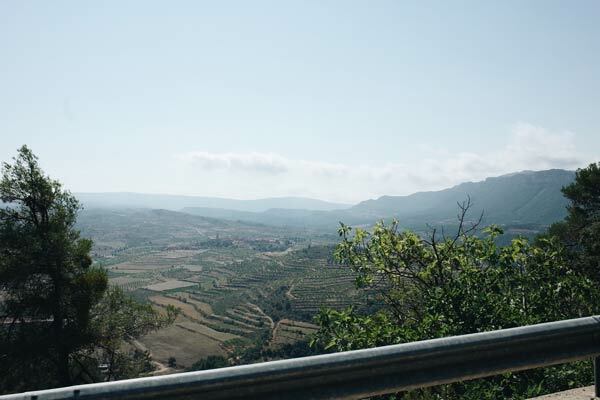 We then head to one of the most incredible locations of the route: Siurana. A medieval village sitting at the top of a huge limestone rock with the Pantà de Siurana at its feet. The hardness of this stage has nothing to envy to the previous one. Although we face less elevation gain, the climbs are famous by their steep climbs. A good example are the three 16% switchbacks that will finish our 320km in the Castell d’ Escornalbou. Book your place and enjoy a unique experience completing your biggest challenge. After 160km of the first stage the small Fonda Margalef welcomes us with an abundant and varied dinner. Surrounded by the nature that makes up the Montsant Natural Park, the accommodation provides an ideal environment to rest between both stages. In the summer months do not forget your swimsuit. The pool awaits you. Register yourself at the Fonda Margalef. Your luggage and a new pack of supplies await you in the room. Varied breakfast in the hotel. Leave your luggage ready at the reception. Single room just for you.